Ford's Investment and American Jobs in the U.S.
Ford's investment in the U.S. and American jobs remains strong. In the past five years alone, Ford has invested $12 billion in U.S. plants and created nearly 28,000 U.S. jobs. 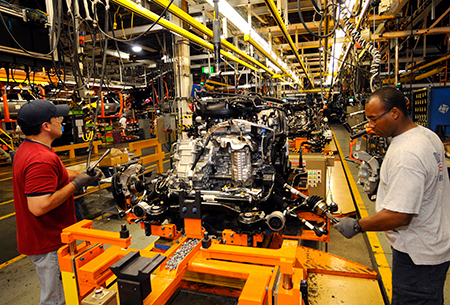 Ford has more hourly employees and produces more vehicles in the U.S. than any other automaker. Ford has more than 85,000 U.S. employees. Ford announced a plan, two years from now, to move production of the Ford Focus in Michigan so it can achieve financial success with that vehicle. This change was part of the contract Ford ratified with the UAW last year. There is absolutely no impact on U.S. jobs. In fact, Ford is moving two exciting new vehicles — that have not even been announced yet — to the Michigan plant where the Focus is produced. Ford will continue to make cars, trucks, and sport utility vehicles (SUVs) in the United States, as it has for more than 100 years.